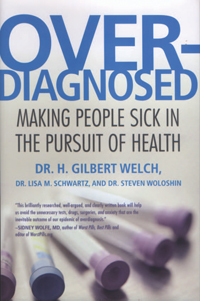 Drawing on twenty-five years of medical practice and research on the effects of medical testing, Welch explains in a straightforward, jargon-free style how the cutoffs for treating a person with "abnormal" test results have been drastically lowered just when technological advances have allowed us to see more and more "abnormalities," many of which will pose fewer health complications than the procedures that ostensibly cure them. Citing studies that show that 10 percent of two thousand healthy people were found to have had silent strokes, and that well over half of men over age sixty have traces of prostate cancer but no impairment, Welch reveals overdiagnosis to be rampant for numerous conditions and diseases, including diabetes, high cholesterol, osteoporosis, gallstones, abdominal aortic aneuryisms, blood clots, as well as skin, prostate, breast, and lung cancers. With genetic and prenatal screening now common, patients are being diagnosed not with disease but with "pre-disease" or for being at "high risk" of developing disease. Revealing the economic and medical forces that contribute to overdiagnosis, Welch makes a reasoned call for change that would save us from countless unneeded surgeries, excessive worry, and exorbitant costs, all while maintaining a balanced view of both the potential benefits and harms of diagnosis. Drawing on data, clinical studies, and anecdotes from his own practice, Welch builds a solid, accessible case against the belief that more screening always improves health care.